Service was fairly quick as we got there before the lunch crowd came in. An elderly man took our order and within 10 minutes, our first dish arrived. 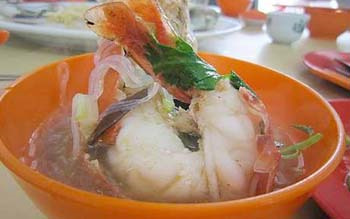 Between the four of us, we had a steamed patin fish (RM54 for 900gm), crispy pork bacon (RM12), stir-fried sweet potato leaves and the highlight of our meal, sang har tang hoon soup (RM72 for two prawns). 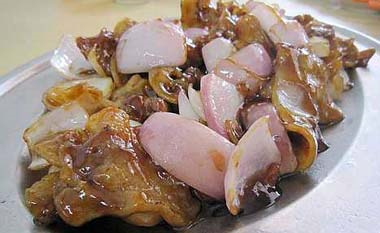 The bacon was deep-fried, tossed with onions and drizzled with honey and soy sauce. Good stuff: Crispy pork bacon comes highly recommended. “This is good stuff!” I remarked, in between bites. So good, yet so bad for the heart and waistline. Throw in a handful of pork lard and I may need an angioplasty sooner than I think. Sweet potato leaves may be easy to find at the market, but it isn’t as easy to cook. Cook it too long and you get a pile of mush. When it’s undercooked, your jaw gets a good workout. But the chef at Hong Hing got it right — the leaves were fragrant from the garlic chunks, tender at the stems and lightly seasoned with salt. 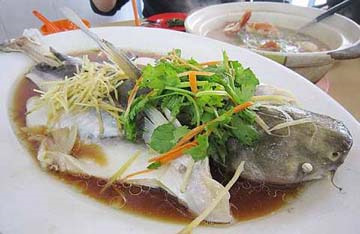 Fresh: The steamed patin fish was sweet and smooth.